In September 2014, for the crime of exceeding the individual political contribution limit by $20,000, Dinesh D'Souza was sentenced to live for 8 months in a state-run confinement facility, community service, a $30,000 fine, and weekly psychological therapy. 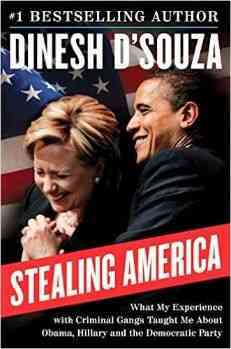 The book Stealing America is the result of his experience with the courts, with living with criminals in the facility, and his insights into the criminal organization of Democratic Party. The judge who handed down D'Souza's sentence evidently intended to teach him a lesson, but the lesson he learned is probably not the one the judge intended. In having to sleep every night in the halfway house with gang-members, drug-dealers, thieves, even murderers, D'Souza learned how criminals think, how they run their scams, and in so doing he realized how the politicians today are running large-scale versions of the very same criminal scams his fellow detainees were incarcerated for. I read Stealing America in one sitting. D'Souza skilfully weaves his personal experience of what is surely the most traumatic year of his life with persuasive arguments that make the case that the current Democratic Party is being run as an organized criminal enterprise. He also talks about Saul Alinsky's life and career and his influence on the two biggest names in the Democratic Party - Hillary Clinton and Barack Obama. I found Stealing America to be both thought-provoking and fun to read. The anecdotes of D'Souza's interactions with his "criminal compatriots", as he calls them, are amusing. He starts his sentence afraid of what he will face, checking into the facility, where he is to sleep every night for eight months, in black pants and tee, a cheap watch, and a rented car. By the sixth month of his stay he was driving his Mercedes, wearing his Rolex and his regular clothes. The staff have stumbled on videos of his media interviews and consider him a celebrity. Fellow denizens respect him for going up against the "Big Kahuna." Stealing America is a must-read for anyone who has gotten the sense that politicians have learned to game the system for their own gain. I highly recommend it.